Rumour No.1: According to the Telegraph, Chelsea have added Wolfsburg striker Edin Dzeko to their January shopping list. Dzeko, who is 6ft 3in and built like the proverbial shithouse, is one of the most powerful young forwards in Europe, which probably explains why he has also been linked with Man Utd and AC Milan. With Didier Drogba flying off to the African Cup of Nations soon, Dzeko would be a sensible addition to Carlo Ancelotti’s squad. Also on Chelsea’s shortlist – still, apparently – is Atletico Madrid whizz-kid Sergio Aguero. Rumour No.2: We told you yesterday that Spurs were keen on Matty Upson. Well, the Mirror claims today that the mighty Yids have tabled an £8m bid for the West Ham and England centre-back. Alan Hutton and David Bentley – or both – could be used to sweeten the deal. 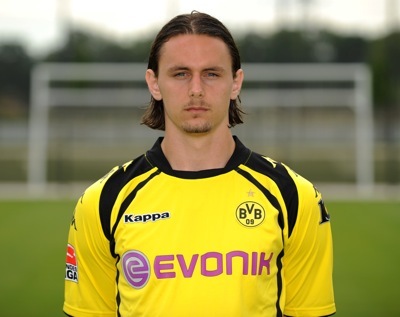 Man City also fancy Upson, but may have to be content with signing Neven Subotic (pictured above), a 21-year-old Serbian who currently plays for Borrusia Dortmund. Subotic has been linked in the past with Arsenal, but – as is so often the way with footy rumours – nothing came of it. Subotic is tall (6ft 4in) and stylish, but prone to the occasional error.